• Labradoodle puppy breeders are shown below listed alphabetically by State and city. 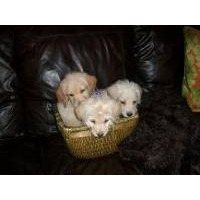 • Click on underlined words in the dog breeders list to see Labradoodle puppies for sale. • Please tell the Labradoodle dog breeders with puppies for sale that you found them on BreedersClub.net. 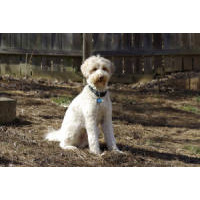 Looking for Australian Labradoodles? Click Here. Hope Springs puppies are socialized from Birth until the time that he or she arrives home to their new families. The parents of the pups are my pets so I know what to expect from any pairing. Our family has been breeding and raising healthy, beautiful AKC and CKC registered dogs for the last 17 years, paying close attention to conformation, temperament and health. Our breeding program and facilities are inspected by AKC and have always been in full compliance, and have consistently received good reviews. Our breeding lines have an excellent track record of producing healthy offspring. All pups are dewormed regularly and vaccinated prior to leaving for their new homes. We are a small 80 acre Ranch, located in Huntington, Arkansas, where we have plenty of room for our dogs to run and be dogs. Each of our dogs is a member of our family and loved as such. When we have puppies our goal is to place healthy, happy and well-loved puppies with likeminded families. We raise our puppies with a hands on approach from the moment they are born. Working very closely with our Veterinarian we ensure that all the puppies are healthy and have a great start in life. This assures us that when the time comes for the puppies to leave, they are ready for their forever homes as strong, and very well socialized puppies for you to love and have as the best possible friend for life. I have been a dog breeder for over 35 years and started as a hobby turned professional after I retired as a Special Education teacher. I can't imagine my life without canines in it and I am a self professed puppy addict. I enjoy helping people and their dogs and also training my canines . My dogs are crate trained, fully socialized and health guaranteed. Shots UTD. I am on my 4th generation of my 2 main breeds. I truly breed for the betterment of the breed. You will get an awesome dog who loves kids, people and other pets. Looking forward to meeting you soon. We offer exceptional puppies, farm raised from quality AKC and tested parents. 2 year health guarantee with outstanding customer service. We are located to the southeast of Denver in the country outside of Franktown. Our area has wide open space with Majestic views of the Rocky Mountains. For over 22 years, we have been devoted to raising beautiful, healthy, well-balanced and socialized puppies. We combine excellent confirmation, exceptional good looks, intelligence and athleticism for the perfectly balanced dog. 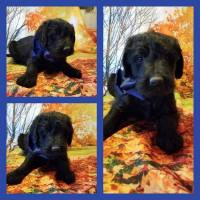 Our puppies are bred for wonderful dispositions and temperaments to provide great companionship and use as family pets, service dogs, therapy dogs, conformation and hunting companions. You will not find more loyal, affectionate, and trustworthy companions. Every puppy is given a complete health check by a licensed vet, wormed and up to date on vaccinations when they go home. All of our adults are completely health from hereditary problems and are backed by a health guarantee. We feel we are a superior and quality breeder and hope you feel the same. Breeding since 2010 on our 60 acre Colorado prairie farm where dogs roam freely every day. Puppies are born inside our home and handled daily. Homeschooling provides the extra time needed for excellent dog and puppy care. All adult dogs have genetic testing including: OFA, CERF, EIC and CNM. Puppies have dew claws removed, 1st set of shots and vet visit before going home at 8 weeks and come with a 26 month health guarantee. We are located just 1 hour and 20 min southeast of Denver. I have been breeding home raised pups for 16 years on my 8 acres of land. My dogs play and swim in our pond. My pups are raised In my home with lots of love.. I was a Veterinarian Technician for 20 years, my pups have vaccinations, worming and Health certificate. I give a 2 year Health guarantee. We begin our breeding process with happy, healthy parents. Our puppies are all whelped in our home where we carefully and lovingly monitor them at all times. Our puppies are well socialized, interacting with our family and other pets. We're sure you'll fall in love, and see how special and "Doodle-icious" they really are! We are the original Doodle Breeder in the state of Florida. With more than 10 years of dog breeding experience, Susan is a passionate believer in helping new puppy owners be successful. She believes in building a lifetime relationship with her customers, which starts with first contact, through the buying and selecting process, and into the raising of your puppy. Adding a puppy to your home is no less important of a decision than bringing a child into your life, and Susan wants to make this experience just as wonderful. Susan and her partners at are experts in all areas of care for your puppy and dog and offer advice and recommendations for every aspect of their care. Experience the confidence and benefits of a home-based breeder today! We have been breeding since 2001. We are very proud to say we are a referred and recommended breeder for children with Autism or Downs syndrome and have provided many excellent service dogs; our niche is for families with children. Doodles are known for exceptional intelligence and trainability, their low to non-shedding coats (good choice for allergy sufferers!) and they excel as service/therapy dogs and in canine sports. Our puppies are raised with adults & children of all ages and are very well socialized. The puppies will be up to date with their shots & deworming. Parents are tested for hips, elbows and eyes, providing you with healthy, happy, well adjusted puppies. We offer a 2 year health guarantee!We also have Stud Service available. See our ads in the Stud Service section. We combine excellent confirmation, exceptional good looks, intelligence and athleticism for the perfectly balanced dog. In order to achieve this goal, we begin with wonderful foundation dames and sires that possess several generations of hip, eye, and clearance. Our puppies are bred for wonderful dispositions and temperaments to provide great companionship and use as family pets, therapy dogs, seeing eye dogs and of course, hunting companions. You will not find more loyal, affectionate, trustworthy companions. We invite you to come see our dogs, and facilities. I have been breeding for 13 plus years. Our puppies are socialized and come with vaccines and wormings up to date. I give a two year Health Guarantee with each puppy. Finding good homes for our puppies is paramount. I require a phone call interview for each puppy reserved. All pups are current on shots, and come with a written 1 yr health guarantee. We strive to give each puppy raised on our farm the best possible start in life it can have! We are located in Indiana. Individuals, families, qualified institutions. Parents on farm, available for interaction. Breeding over 20 years with animal husbandry in domestic and exotic animals since childhood. Hip, eye and health guarantee. Vaccinations, dewormings. Socialized, temperature acclimated. Breeding loving, intelligent, well tempered dogs. Stunning, top health adults. Show and working lines frequently bred together, producing some of the most intelligent, well mannered, stunning animals ON EARTH. Striving toward dogs on calmer side, retaining hunting,companion instincts. Well suited with the kids in back yard, running companions, watch, work. Our lines tend toward intelligent look you in the eye, read your mind attitude, always wanting to please you. On the playful side with WONDERFUL PERSONALITIES. Very personable dogs fitting any family or situation. Many customers have told us their dogs thought they were human. Hand deliver to areas between Denver and Chicagoland, home delivery available. Hand delivery and shipping is available worldwide for additional fees. Happy Family Raised puppies! Our breeding Doodles are Family Members FIRST, breeding dogs second. We have retired females living in our home so we use Guardian families for new younger breeding females,& the few males we own. We've been breeding since 2003. We LOVE helping others know the delight of this Family-oriented, happy, easy going breed. We offer Puppies who'll grow from 15# to 55# Doodles several times a year. You are treated the way we would want to be treated when working with Doodle-loving people. Full 2 yr warranty, 1st vaccination and MICROCHIP are always included! Delivery in person or via air cargo are options we can discuss, or of course you may come and visit or pick up your puppy and treats in person. GANA Member, Premium Breeder List Member - both requiring proof of objective responsible health testing on parents. For the best Doodle from our home to yours! Our puppies come from an environment where they receive lots of love and attention. The children enjoy learning to know each puppy's unique personality and it brings much joy to see them interacting with them from day to day. Our goal is to give them as much love and affection from our family, to prepare them to become a part of yours. We have been raising dogs at our family farm in East Texas for over 20 years. Our puppies have been featured in the Houston Chronicle, in Gander Mountain publications, in Beatrix New York catalogues, and in the book Rover: The Woof Edition. Our farm and puppies have also been filmed and featured on TLC's "Quints by Surprise." All of our puppies are well socialized and doggy-door trained. Their shots and deworming are current, and we guarantee their health. They are also started on crate and house training and should be easy to finish training. We do not ship because we prefer that families come to our farm to meet the puppies and choose the one that is right for them. Our parents dogs are selected from the healthiest, kindest and most trainable of the dogs to be considered at our kennel. First generation crosses (F1) and F1b will be available now with multi-generation crosses. There will be some cross backs to poodles to obtain a more hypo-allergenic coat. We have been breeding, raising and training dogs since 1991, and Doodles since 2001. This breed directory page features Labradoodle dog breeders with puppies and/or adult dogs for sale. Once you purchase your new found friend, you will want to provide it the best in pet health care. Be sure to visit our online discount pet supplies catalog and order NuVet Plus™ to keep your puppy and adult dogs in top condition. The discount catalog also features collars, leashes, carriers, general pet care products and much more. BreedersClub.net does not pre-screen the Labradoodle dog breeders who advertise their puppies and dogs for sale in the BreedersClub.net breeder directory and in the classified ads. We require all advertisers to agree to our advertising terms. You should ask the Labradoodle dog breeders you talk with for references from past buyers and veterinarians.